Mr. Lincoln’s respect for work was fundamental for his disdain for slavery. William Wolf wrote in The Almost Chosen People: “Lincoln felt strongly about the essential importance of labor to society and liked to make it concrete by referring to the injunction on work in Genesis. He had known in early life what it meant to earn bread in the sweat of his brow. He was offended by the arrogant complacency of the planter interests and especially by their mouthpieces in the clergy.”8 Mr. Lincoln understood that fundamental to one’s attitude toward slavery was one’s willingness to let others’ sweat on one’s behalf. Perhaps as a young man, Mr. Lincoln had done his share of useless labor to last a lifetime. Mr. Lincoln did what was necessary and he expected others to do the same. His work ethic was fundamental to his attitudes toward slavery. A man had the right to the fruits of his labors — and an obligation to pursue his labors to the best of his ability. And the rewards of hard work were important in politics as well — one reason that the 1849 appointment of Justin Butterfield to the federal Land Commissioner’s post so disturbed Lincoln. Butterfield hadn’t worked in the election and rewarding him for his lethargy was bad politics and bad government. Liberty, work, and justice were closely connected concepts for Mr. Lincoln. “The world has never had a good definition of the word liberty, and the American people, just now, are much in want of one. We all declare for liberty; but in using the same word we do not all mean the same thing. With some the word liberty may mean for each man to do as he pleases with himself, and the product of his labor; while with others the same word may mean for some men to do as they please with other men, and the product of other men’s labor. Here are two, not only different, but incompatable [sic] things, called by the same name — liberty. And it follows that each of the things is, by the respective parties, called by two different and incompatable [sic] names — liberty and tyranny,” Mr. Lincoln told the U.S. Sanitary Commission Fair in Baltimore on April 18, 1864. Mr. Lincoln’s philosophy was often revealed in letters designed for publication. One such letter was to Kentucky editor Albert G. Hodges in April 1864. President Lincoln began: “I am naturally antislavery. If slavery is not wrong, nothing is wrong. 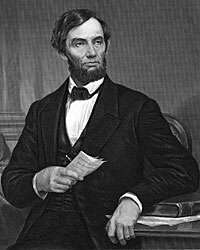 I cannot remember when I did not so think and feel, and yet I have never understood that the Presidency conferred upon me an unrestricted right to act officially upon this judgment and feeling.”14 Mr. Lincoln understood that he could not act outside of the powers granted by the Constitution. The most powerful tool Mr. Lincoln possessed was the doctrine of military necessity that he used to proclaim emancipation on January 1, 1863. The necessity was linked to constitutional provisions associated with the birth of the Union. No President, except in the gravest national emergency, could act alone outside the constitution. Mr. Lincoln also realized that the pursuit and protection of liberty required a long struggle. After President Lincoln issued the Emancipation Proclamation, New York Governor Edwin D. Morgan visited the White House. Mr. Lincoln told Morgan, who was also chairman of the Republican National Committee: “I do not agree with those who say that slavery is dead. We are like whalers who have been long on a chase — we have at last got the harpoon into the monster, but we must now look how we steer, or, with one ‘flop’ of his tail, he will yet send us all to eternity.”16 Mr. Lincoln realized that freedom depended upon Union — but he also realized that some supporters of Union opposed the actions he had taken to grant freedom to Southern slaves. He addressed these critics in an open letter to Union supporters meeting in Springfield, Illinois in September 1863. You dislike the emancipation proclamation; and, perhaps would have it retracted — You say it is unconstitutional — I think differently. I think the constitution invests it’s [sic] commander in chief, with the law of war in time of war — The most that can be said, if so much, is that slaves are property. Is there — has there ever been — any question that by the law of war, property, both of enemies and friends, may be taken when needed? And is it not needed whenever taking it, helps us, or hurts the enemy? Armies, the world over, destroy enemie’s property when they can not use it; and even destroy their own to keep it from the enemy — Civilized beligerents do all in their power to help themselves, or hurt the enemy, except a few things regarded as barbarous or cruel — Among the exceptions are the massacres of vanquished foes, and non combattants, male and female. “We have to hold territory in inclement and sickly places; where are the Democrats to do this? It was a free fight, and the field was open to the War Democrats to put down this rebellion by fighting against both master and slave long before the present policy was inaugurated. “There have been men base enough to propose to me to return to slavery the black warriors of Port Hudson and Olustee, and thus win the respect of the masters they fought. Should I do so, I should deserve to be damned in time and eternity. Come what will, I will keep my faith with friend and foe. My enemies pretend I am now carrying on this war for the sole purpose of Abolition. So long as I am President, it shall be carried on for the sole purpose of restoring the union. But no human power can subdue this rebellion without the use of emancipation policy, and every other policy calculated to weaken the moral and physical forces of the rebellion. In a letter to Kentucky editor Albert G. Hodges, for example, Mr. Lincoln somewhat disingenuously said, “I add a word which was not in the verbal conversation. In telling this tale I attempt no compliment to my own sagacity. I claim not to have controlled events, but confess plainly that events have controlled me. Now, at the end of three years struggle the nation’s condition is not what either party, or any man devised, or expected, God alone can claim it. Whither it is tending seems plain. If God now wills the removal of a great wrong, and wills also that we of the North as well as you of the South, shall pay fairly for our complicity in that wrong, impartial history will find therein new cause to attest and revere the justice and goodness of God.”31 Mr. Lincoln may not have controlled events, but he did a pretty good job trying to steer them. Roy P. Basler, editor, The Collected Works of Abraham Lincoln, Volume VIII, (March 17, 1865). Roy P. Basler, editor, The Collected Works of Abraham Lincoln, Volume II, p. 275 (October 16, 1854). Roy P. Basler, editor, The Collected Works of Abraham Lincoln, Volume II, p. 222 (ca July 1, 1854). Roy P. Basler, editor, The Collected Works of Abraham Lincoln, Volume II, p. 255 (October 16, 1854). Roy P. Basler, editor, The Collected Works of Abraham Lincoln, Volume III, (July 10, 1858). Roy P. Basler, editor, The Collected Works of Abraham Lincoln, Volume IV, (December 1-15, 1859). Roy P. Basler, editor, The Collected Works of Abraham Lincoln, Volume IV, (March 5, 1860). William Wolf, The Almost Chosen People, p. 177. Roy P. Basler, editor, The Collected Works of Abraham Lincoln, Volume II, p. 222 (July 1, 1854). Roy P. Basler, editor, The Collected Works of Abraham Lincoln, Volume III, p. 494 (July 10, 1858). Roy P. Basler, editor, The Collected Works of Abraham Lincoln, Volume IV, p. 121 (Letter to J.M. Brockman, September 25, 1860). Roy P. Basler, editor, The Collected Works of Abraham Lincoln, Volume I, p. 411-412 (Fragment on tariff, December 1847). Roy P. Basler, editor, The Collected Works of Abraham Lincoln, Volume VII, p. 302 (Address at Sanitary Fair, Baltimore, Maryland, April 18, 1864). Roy P. Basler, editor, The Collected Works of Abraham Lincoln, Volume VII, p. 281 (Letter to Albert G. Hodges, April 4, 1864). Roy P. Basler, editor, The Collected Works of Abraham Lincoln, Volume IV, p. 29 (March 6, 1860). Emanuel Hertz, Lincoln Talks, p. 344 (Ida M. Tarbell). John G. Nicolay and John Hay, Abraham Lincoln: A History, Volume VI, p. 432 (Roy P. Basler, editor, The Collected Works of Abraham Lincoln, Volume VII, p. 500 Letter to Charles D. Robinson, August 17, 1864 and Volume VI, pp. 406-410, Letter to James C. Conkling, August 26, 1863). Francis B. Carpenter, The Inner Life of Abraham Lincoln: Six Months at the White House, p. 305-306 (Gray County Herald). Francis B. Carpenter, The Inner Life of Abraham Lincoln: Six Months at the White House, p. 307-308 (Gray County Herald). Francis B. Carpenter, The Inner Life of Abraham Lincoln: Six Months at the White House, p. 308 (Gray County Herald). James M. McPherson, Abraham Lincoln and the Second American Revolution, p. 136-137. Don E. Fehrenbacher, Lincoln in Text and Context, p. 137-138. Don E. Fehrenbacher, Lincoln in Text and Context, p. 127. John G. Nicolay and John Hay, Abraham Lincoln: A History, Volume VI, p. 436-437. John Hope Franklin, “The Emancipation Proclamation: An Act of Justice”, Prologue: Quarterly of the National Archives, Summer 1993, vol. 25, no. 2, . James M. McPherson, Abraham Lincoln and the Second American Revolution, p. 87. John G. Nicolay and John Hay, Abraham Lincoln: A History, Volume VI, p. 437. Gabor S. Boritt, editor, The Historian’s Lincoln: Pseudohistory, Psychohistory, and History, p. 177 (LaWanda Cox). Don E. Fehrenbacher, Recollected Words, p. 23 (T. J. Barnett). David M. Potter, The Impending Crisis, p. 354. Martin H. Greenberg and Charles G. Waugh, editor, The Price of Freedom: Slavery and the Civil War, Volume I, (John T. Hubbell “Abraham Lincoln and the Recruitment of Black Soldiers”). Allen C. Guelzo, Abraham Lincoln: Redeemer President, . Roy P. Basler, editor, The Collected Works of Abraham Lincoln, Volume V, p. 403-404 (September 2, 1862). Roy P. Basler, editor, The Collected Works of Abraham Lincoln, (December 1, 1862).